Guam has some of the most stunning beaches you might ever see but the island’s natural beauty extends far beyond white sand shores and sparkling turquoise waters. Here are five ways visitors can experience, explore, and enjoy Guam’s natural spaces and learn about island culture and wildlife. One of the most adventurous and memorable outdoor activities you can experience on Guam is “boonie stomping,” which is what islanders call hiking. Guam’s landscape is dotted with stunning off-the-beaten path sites including secluded rivers and coastlines, cascading waterfalls, majestic mountain peaks, natural caves, remnants of ancient Chamorro civilization, and historical World War II battlegrounds. Boonie stomping trails range from easy walks across beaches to very difficult treks over rough rocky terrain. Many trails are unmarked and conditions can widely vary depending on weather, so it is recommended to go boonie stomping with an experienced guide or with a group such as the Guam Boonie Stompers. Every Saturday, Guam Boonie Stompers leads groups to remote beaches, snorkeling sites, waterfalls, mountains, caves, and cultural and historical sites. To participate, the group meets at 9:00 AM at the center court of Chamorro Village in Hagåtña. After a short briefing, participants take their own transportation and meet at the trailhead. Children under the age of 12 must be accompanied by a parent or guardian. There is a nominal $2.00 fee and no reservations are required. Find out where the group is headed this week or view photos from past hikes on the Guam Boonie Stompers Facebook page: facebook.com/GuamBoonieStompersInc. Up until World War II, Chamorro people vastly preferred herbal remedies over Western medicine and suruhanus (herb doctors) were routinely consulted for common ailments. The suruhanu uses various plants, including roots and leaves, to make medicine to treat common ailments such as fever, rash, sores and even diabetes, cancer, and dementia. A suruhanu might prepare an herbal drink or an ointment made of a mixture of ground herbs and oils, and also engage in massage. One modern day suruhana is Ms. Bernice Nelson, manager of Åmot Farm. Amot Taotao Tano means “medicine for the people of the land” and Åmot Farm grows herbs and native medicinal plants that are used for traditional healing practices. 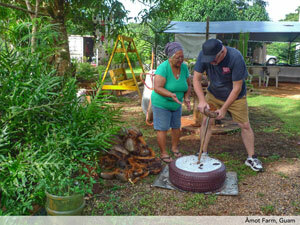 Ms. Nelson also teaches the community about the island’s plants and herbs that have healing properties. Various plants line the pathways at Åmot Farm, identified by informational signs that includes interesting information such as the plant’s Chamorro, English and scientific names and its healing properties. Åmot Farm is a short drive from Two Lovers Point and is open Monday through Friday with farm tours at 10:00am and 1:00pm. It is recommended to email or call ahead to make a reservation or to inquire about workshops. More details, along with photos of Åmot Farm, can be found on its Facebook page: facebook.com/amotfarminc. The largest botanical garden in Guam, Hamamoto Garden is set upon 50 sprawling acres in Yona and has welcomed visitors through its gates for 22 years. The garden features local trees, plants, and flowers as well as a wide variety of imported trees that were selected and planted by the owner of the garden, Mr. Hitsamitsu Hamamoto. Mr. Hamamoto also grows, harvests, and roasts his own coffee beans and makes raw honey from his 20 beehives. Hamamoto Garden is open daily and reservations are recommended. Visitors can also pre-arrange for fresh fruit platters and special demonstrations such as coconut husking. 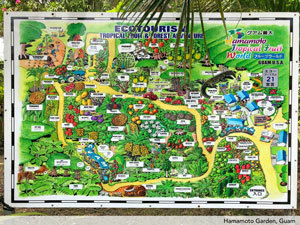 For more information about Hamamoto Garden visit hamamoto-guam.com. 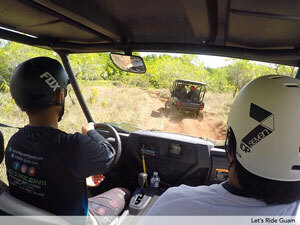 Experience the jungles of Guam and get closer to nature through an off-road adventure with Let’s Ride Guam, a local tour company whose mission is to offer guests a unique and unforgettable experience exploring Guam’s beautiful landscapes and views while ensuring the sustainability of the island for visitors and residents alike. Let’s Ride Guam aims to provide a fun-filled experience while educating participants about the importance of building a strong ecotourism industry for the future of Guam. 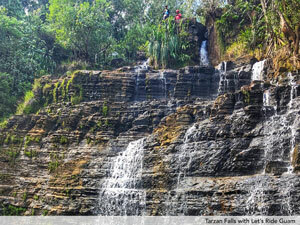 Guests traverse along trails through the rolling landscapes of the southern village of Santa Rita, down to a gorgeous cascading waterfall known as Tarzan Falls. Guests can also experience the thrill of getting behind the wheel of an off-road vehicle and driving over rugged trails and terrain. Find out more about this fun and exciting way to explore Guam by visiting Let’s Ride Guam at letsride-guam.com. 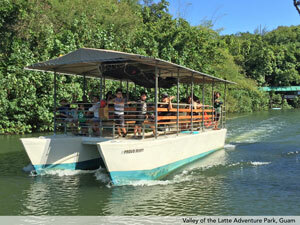 Valley of the Latte Adventure Park rolls a variety of fun activities into one big touring package. Whether it’s cruising down the Talofofo River on a riverboat, stand-up paddleboard, or in a kayak; visiting the animal farm, or finding fresh fruit to sink your teeth into at the plantation, visitors can choose one or all. Valley of the Latte Adventure Park is a great way to combine recreation with education as guests learn and take part in Chamorro cultural activities such as weaving and fire-making, all the while surrounded by the river’s lush, natural beauty. Valley of the Latte Adventure Park provides visitors of all ages and generations to immerse themselves in Chamorro traditions, history, and culture with fun and educational tours and activities. For more information, visit the Valley of the Latte website at valleyofthelatte.com.